Looking at Eich’s photographs put me in mind of the work of Danny Lyon, a photojournalist whose pictures, taken fifty years ago, have a similar focus. Lyon spent two years travelling through the Deep South as the staff photographer for the Student Nonviolent Coordinating Committee (S.N.C.C. ), documenting the organization’s role in the civil-rights movement. He photographed many of the most famous moments of the era, including Black Monday, in Danville, Virginia; the aftermath of the bombing of the Sixteenth Street Baptist Church, in Birmingham, Alabama; and the Mississippi Freedom Summer Project of 1964. 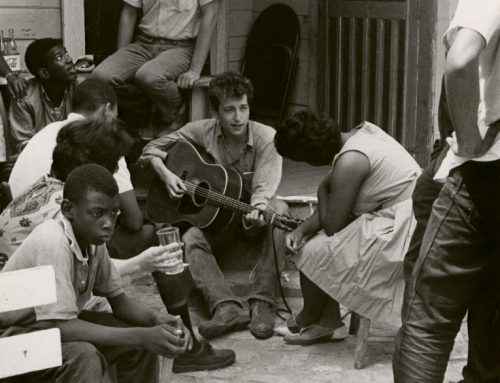 In 1963, he photographed Bob Dylan and Pete Seeger at the S.N.C.C.’s voter-registration drive in Greenwood, where Dylan performed “Only a Pawn in Their Game,” a song about the murder of the N.A.A.C.P. leader Medgar Evers. For the full interview, please visit The New Yorker's blog.